Amongst the beautiful olive groves and sea-front tavernas, summer has arrived on the sun-drenched island of Crete. After losing the love of her life, Ria’s life has been on hold. So when her boss becomes completely unbearable she makes the snap decision to run away to the Greek island of Crete, armed only with her passport. When Ria finds herself working for eccentric novelist Caroline, she meets handsome vineyard owner Tom. He’s charming, mysterious and Ria starts to wonder if it’s not just the beautiful Greek island that she’s falling for. But as Ria gets to know Tom better, she uncovers a tangled web of secrets. What is he hiding? Ria has some secrets of her own. Can she open up to Tom and learn to live again? This summer, escape to the sun with this charming and emotional story about starting over and grabbing happiness with both hands. Review: Lily Graham is a new author to me, but I was keen to read this novel having had a look at the synopsis. 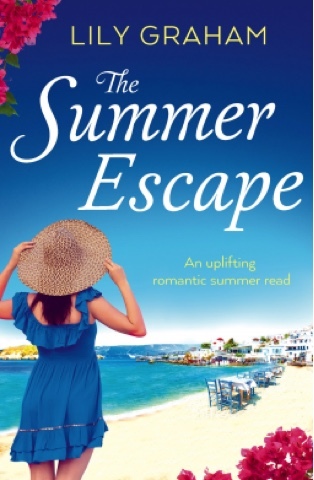 The cover is also something to attract readers, with its lovely summery, Mediterranean feel. I wasn't drawn into the story immediately, but from chapter 2, when the actions of the heroine suddenly became a little bizarre, I was hooked and devoured the rest of the book as fast as I could. The main character is Ria (short for Ariadne, the name due to her father's being Greek). She is somewhat disillusioned with her job as an obituary writer for a newspaper, a job made all the more unsuitable for the young woman because of a tragedy in her recent past and also due to the attitude of her fellow workers and her boss towards her seemingly excellent writing, which they really don't appreciate. Her life takes a turn when she does something completely out of character, gets on a plane and lands up on the beautiful Greek island of Crete. She is very lucky in the people she meets up with there who bring her out of the depression she has been suffering from for so long. In addition to Ria, there are some other really strong and interesting characters in the story, including the local English newspaper editor, Nigel, a retired travel writer, Caroline, Tom and Tony, brothers connected with the wine business, and Iliana, Tony's wife. Ria ends up helping Caroline to write her memoirs, which lead to some amusing revelations. Caroline and Ria develop a lovely relationship; she's a much better boss than the one Ria left behind. I really liked the fact that this is not a simple love story. There is some sleuthing entwined with a growing romance for Ria. There is a mystery to be solved, and she is not going to be happy until all the facts are revealed. I also liked most of the characters Ria meets during her investigations, except of course for the wicked ones that we are not supposed to like at all! Although I was always fairly sure who she was going to fall for, I was not clear until the very end how the mystery would pan out. It was enjoyable watching the growing relationships between Ria and the rest of the characters and also the way in which the clues to the mystery were pieced together. Lily Graham's writing really brings Crete to life on the pages of this book. You can almost smell the souvlaki and feel the sand between your toes and the sun on the back of your neck. I'm not so sure about the Greek coffee though! If you're looking for a summer escape for yourself, pop this one into your bag or suitcase. I'm sure, like me, you will be transported off to the Greek islands and become immersed in the mystery Ria has found.